In the months following the brutal murder of Matthew Shepard, fourteen-year-old Joshua, a half Native American boy, is new to a Boy Scout troop and spending a week camping in northern Wisconsin. The weaker kids in the troop soon realize Joshua is not afraid to stand up to the troop’s ruthless bullies. 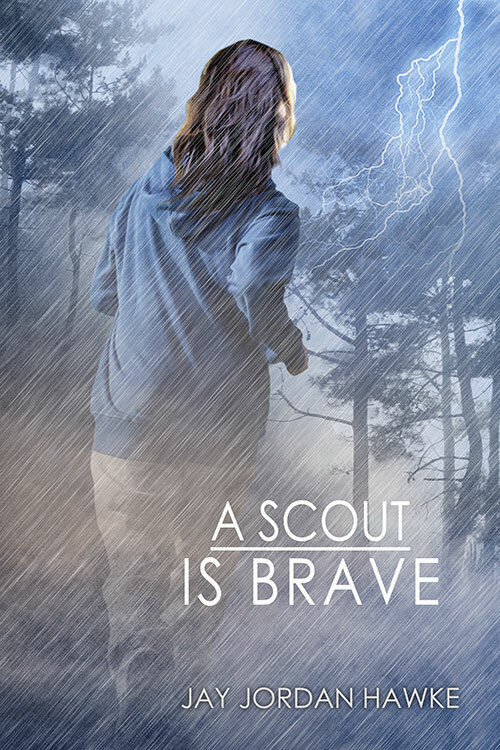 Joshua’s bravery and kindness is infectious, and the bullied Scouts quickly find their own inner strength. This is the sequel to Pukawiss the Outcast and while it reads just fine on its own, I recommend reading Pukawiss first as you will gain a much deeper understanding to undercurrents within the book. This is especially true regarding Joshua’s struggle with his mother and how the pastor/Scout troop leader wish to mould him and his fellow youth as well as the strength of Native American mysticism that runs through the book. Joshua is a very likeable young man and has a charisma about him that quickly draws the bullied children to him as he stands up for them and himself. It also touches upon many aspects of growing up and how adults try to manipulate things in an effort to guide youth, some very well intentioned albeit thoughtless and others because it is simply the way things have always been done. Joshua confronts unintended bigotry when he attends coursework for badges and even during a ceremony intending to promote Native american values. Reading what happened to him reminded me of an incident in my own childhood well over a decade before this was set, when my public school class studied Native Americans and were assigned “Indian” names. I explained that I didn’t need one; I already had one. “You can’t use that, you have to have a proper one,” I was told. This indignity was compounded when Thanksgiving rolled by. I got to make a Pilgrim hat out of paper to wear to lunch. Boys got to choose between making a Pilgrim hat or a headband with a paper feather. Refusal got me, “But it’s Thanksgiving!” No amount of discourse could get anyone to see that any of it was offensive, no matter that this as unintentional on their part. Then there was the time I applied to a student exchange program. My father, a recently retired serviceman, was fawned over because they assumed he was as they said to his face, “a poor Indian dirt farmer”. The local committee members were busy congratulating each other on being so forward in their thinking that they would welcome such a man and help him gain sponsorship for his daughter to study abroad as a high school exchange student that they completely failed to see their own hypocrisy. Needless to say, I decided to not participate in their program. Joshua’s camp experiences will no doubt echo true for many other children of Native descent who have had to deal with non Natives. Add to the mix that his mother is white and at odds with his heritage and you again have a very familiar story for many youths of mixed heritage. When you toss in the gay, mix in conservative religion, and Scouting, you get a volatile mix indeed. It’s a frank look at growing up different, remaining true, and taking a stand for what’s fair, just and right. It speaks about what has been so wrong for so long, allowing us to see how things have changed, are changing, and what still needs to change. Recommended for youths ages 12 and up and for adults who enjoy well written YA stories. This entry was posted in 20th Century, Action, Adventure, ebook, Paperback, Part of a series, Young Adult and tagged lgbt youth, scouting on December 29, 2014 by Kimichan.